Readers have loved romance novels for hundreds of years. The deep emotional connection developed by talented romance writers has created loyal fans, who eagerly anticipate the next release from their favorite author. While the digital age and the growing use of e-readers have negatively impacted much of the publishing industry, the Romance Genre has enjoyed healthy growth, which many attribute to e-readers allowing for more discreet reading by fans. Despite the positive trend, it’s important for Romance Authors to balance providing digital distribution with the implementation of anti-piracy strategies. 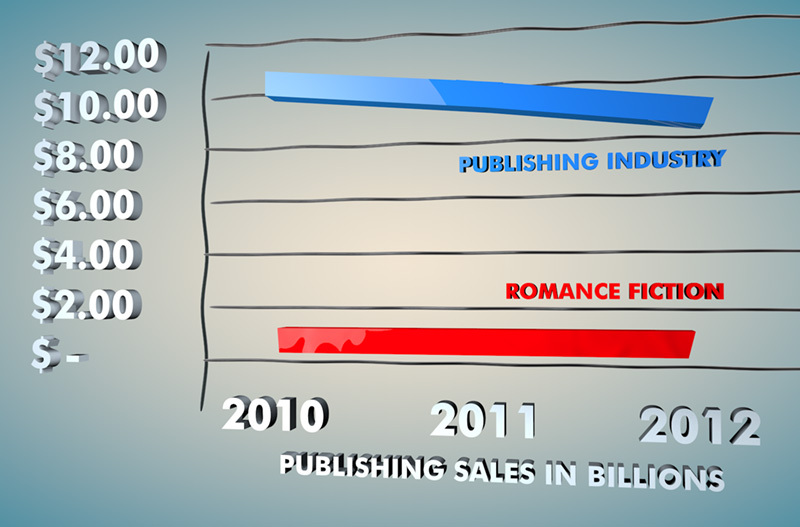 Chart showing the decline in industry-wide revenue compared to growing Romance Fiction Revenue. The digital age allows for consumers to access things faster, more conveniently and with greater privacy. However, convenience can mean bypassing a pay-wall. Even the most loyal customers can’t pass up a free deal if it’s staring them right in the face. And many times, these loyal readers don’t even associate the free access with the act of piracy. At DMCA Force, we often see random PDF files hanging out on the Internet that pop up whenever a user decides to search for “book title + PDF” or “Author’s Name + PDF”. That PDF term can turn into a severe sales detractor when a loyal reader sees that there’s a PDF file just one click away that will allow them to get the file now and read it on their device of choice. It is disheartening to think that a fan wouldn’t know that to support the author they should always buy legally however, from the customer’s perspective, they might not even be aware that they are breaking the law or hurting a favored artist. The thought process of these accidental pirates goes something like “Well, it’s the first thing listed on the search results first so it must be okay.” Search position, in this sense, creates the perception of legitimacy. It’s vitally important for Romance Authors and Publishers not to get caught up in the fact that sales are steady or even growing and learn hard lessons from other copyright holders. No matter what, a portion of piracy is impacting sales revenues negatively. The music industry has been battling digital piracy since the early 2000’s through the RIAA and other organizations representing the biggest corporate interests. Despite ongoing actions and some victories, like the Napster case, digital piracy has remained problematic. This is partially due to the fact that independent musicians have looked at piracy as a way of self-promotion and hoped that by flooding the piracy world with their free music and albums they would increase ticket sales, be discovered or “make it big”. This flood of free content contributed to consumer confusion and users began to be unable to distinguish between sanctioned free content that musicians wanted people to find and infringing pirates. In the early years, independent musicians who did not want their music out there didn’t have the resources to do anything about it because anti-piracy services were relatively unknown and costly. Fast-forward fourteen years later and we now have a music industry that has to battle the consumer mentality amongst the younger generation that music is free. That mentality is exactly what the publishing industry, and specifically the Romance sector, has the opportunity to mitigate and avoid. First, there is strong evidence showing that authors and publishers, large and small, are taking action against piracy by utilizing anti-piracy services and the DMCA. This is a good start, but it is key to understand that increased participation from other authors helps the industry as a whole. Growing the number of participants who actively take a stand against piracy makes it clear to the consumer that Romance Authors only allow for legal access to their books through the legitimate sales channels. Influencing other authors to take a stance will reduce potential consumer confusion. The good news is that anti-piracy services like DMCA Force, make drawing a line even easier. We often hear from authors that just dealing with the piracy personally is time consuming and disheartening so it takes away from their writing time and drive. Full service anti-piracy services, like ours, allow writers to do what they do best while we focus on the piracy and removing it. The main point is, currently anti-piracy services can be affordable and effective, so it’s good for authors to look to utilize a service even when sales are growing. For the music industry and many others, copyright holders didn’t act while their sales were still strong. They waited to participate until they were so frustrated over their declines that their position was untenable and then relied on anti-piracy services to reestablish their margin after the market was saturated with free content. Unfortunately, a sales surge isn’t guaranteed when an anti-piracy service enters the fray, especially when sales have been declining for years or if a company is so large that macro-economic and external factors contribute to sales increases or declines. This can cause frustrations, especially if declining sales continue and that company or individual has to constantly look to cut costs. At that point in the game, spending on anti-piracy can be determined as “too little, too late”. However, if a service is affordable, the cost can usually be absorbed with by even minor sales increases. We often see measurable sales growth from our independent authors and copyright holders or other identifiers that demonstrate that combating piracy is worthwhile. The forecast is clear on one thing though, romance fiction will continue to gain popularity amongst consumers. It will be interesting to see how this dynamic Fiction Sector, composed of a mix of independent authors and large publishing houses, continues to navigate the digital age. Thus far, based on my interactions with our clients, I’m optimistic. I hope that as a group, and as individuals with the same mindset, they can teach other industries that mitigating the damages from piracy is possible and preferable to surrender. PreviousPrevious post:DMCA Force Customer TestimonialsNextNext post:How Much Advertising Is Going to Piracy Sites?